How Do I Monitor My Student Chromebooks? to Google Docs and Drive. Let’s say your school district has just purchased Chromebooks for your students. Whether your district is implementing a 1:1 deployment or are using carts, has anyone considered the new distractions that the Chromebooks offer to the students in the classrooms? SoftLINK will help you successfully manage the Chromebooks that your students are using daily. First and foremost, teachers need to know what their students are doing at all times. In a conventional classroom, this meant walking around the classroom or just glancing around the room during class. Let’s face it, students have and always will goof off during class. Just glancing around a classroom, you may see everyone writing on their papers, but who is to say that Bobby is not really just drawing rather than writing his story? 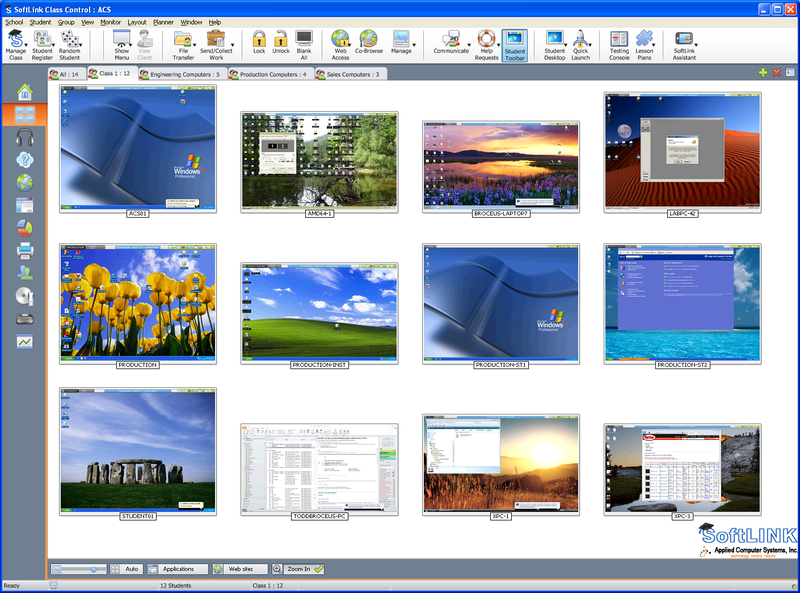 Remotely manage the student computers from the instructor’s desktop. Now think about a Chromebook equipped classroom. Knowing what students are doing is even more important when technology is involved. The internet opens up a wide range of unsavory information to youth, and it is the teacher’s job to prevent students from accessing this type of information during school. SoftLINK’s intuitive Tutor Console provides a thumbnail view of each student’s desktop, allowing you to monitor and see at a glance what each student is currently doing on their Chromebook. It is unfair, impractical, and impossible to believe that a teacher can watch each student 100% of the time. Again, SoftLINK is there to help you with this task. As with any electronic device, students are going to want to surf the web and go to the websites they enjoy the most, social media and gaming sites just to name a few. Using SoftLINK, you can prohibit access to any website, allow access to only an approved list or websites, or block internet access completely. Just imagine how much stress this will alleviate from your class, knowing the students cannot get to websites that you do not approve of. How do you keep the students focused during class, especially with a Chromebook in front of them? Besides limiting their internet access, SoftLINK give you full control over each student’s Chromebook. While giving a lecture, Lock each student’s keyboard and mouse and they will no longer have any control over their device. Better yet, broadcast your teacher’s screen out to the classroom and demonstrate the assignment directly on each individual’s screen rather than requiring them to look at the projector screen. What better way to immerse a student in the activity than to place the content directly in front of them? Upon completing your lecture, ask the entire class a question using the Survey feature. You will get tabulated results instantly, providing you with insight on the class’s overall comprehension. Once you have completed your lecture and the students begin to work on their assignment, SoftLINK still continues to assist you. A student can discreetly ask you for help via a chat interface. If more guidance is required, simply take control of their keyboard and mouse to help guide them to the solution. SoftLINK classroom monitoring software is an invaluable tool for any electronic classroom. SoftLINK supports not only Chromebooks but Windows, OS X, Linux, Android, and iOS as well. If your classroom has a mixture of devices, do not worry. SoftLINK allows you to interact with each operating system and device from a single interface! No matter what your training environment may be, SoftLINK will enhance the learning experience for the students and will provide teachers with the tools to effectively keep them on task.